This edition combines both the Investigator's Guide and Keeper's Guides into one single comprehensive volume and includes extras like character creation and character sheets. Discover the secret history of World War Two: stories of amazing heroism, in which stalwart men and women struggled to overthrow a nightmare alliance of science and the occult; of frightening inhuman conspiracies from the depths of time; of the unbelievable war machines which were the product of Nazi scientific genius - and how close we all came to a slithering end! The Secret War has begun! - How you can keep the home fires burning, become part of the Allied war effort, or risk everything by joining the partisans to bring down the Reich from within! In fact, a whole shoggoth's worth of Cthulhu villainy, enough for any Keeper to have his investigators dead, insane, or running for their lives in no time! The Keeper's Guide to the Secret War will be the essential wartime reference for any Fate Core Keeper or fan of the Cthulhu Mythos. 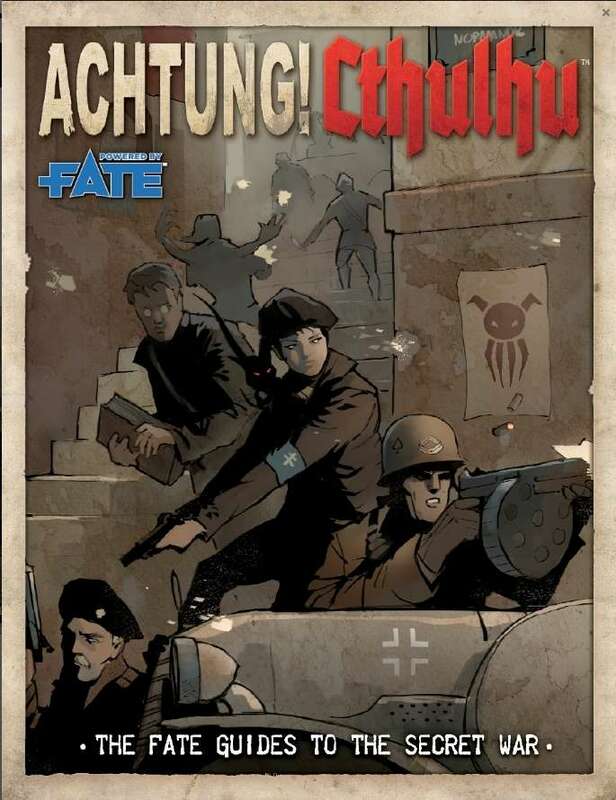 This edition presents new rules for Fate Core suited to playing in a Cthulhu Mythos setting and in a World War Two setting, including sanity and Mythos magic rules, ways to construct and use Mythos creatures, handling conflicts in a warzone, broadening intellectual skills and using all of them in investigation, and more! Achtung! Cthulhu merges these great flavours together, but the Game Creation chapter in the Keeper's Guide tells you how to tweak those individual dials for your Fate campaign. PLEASE NOTE Requires the Fate Core rules to play (available here). Why is this free? Impressive amount of content + production values for $0! Well technically it's pay what you want so you can offer what you feel it's worth. Fair point! Obviously conditioned myself to see PWYW=$0 (not saying that's a good thing). Thank you. Was this supposed to be a single file, 370 pages in length, rather than just a zip file containing the separate Investigator and Keeper Guides? We've provided it as separate files to be more manageable.